Is Lady Olenna the Dowager Countess of Game of Thrones? 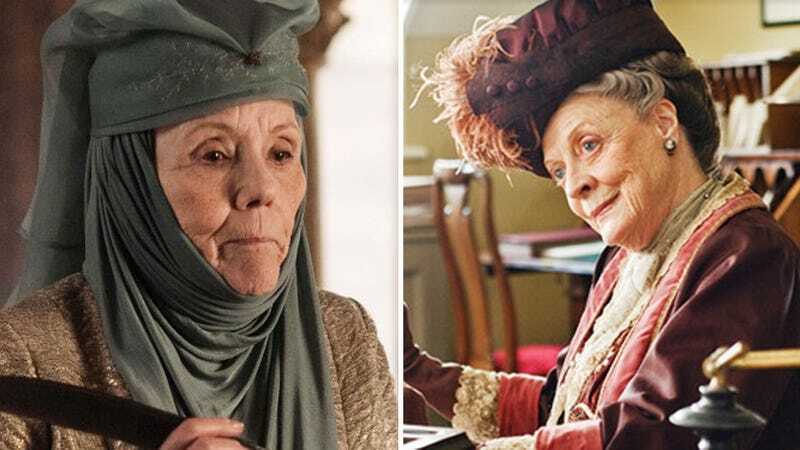 Quick, choose a favorite: Lady Olenna on Game of Thrones or the Dowager Countess on Downton Abbey? Or you know what? Don't choose a favorite. Or choose them both. Let yourself eat cake, but then also have the cake or however it is that that old Mary Antoine Dodson quote goes. Both of these tough old broads are sharp as a tack, cunning, gorgeous and played by real life dames (Dame Diana Rigg and Dame Maggie Smith). They also, as demonstrated by this fabulous supercut by Vulture, are queens of the quip. Take a look and then we'll all go get their faces tattooed on the tops of our feet so that when we sit with our legs extended it will look like they're sitting across from us and we can engage in some weird very normal puppet theater.